Note: As Wikipedia classifies Gibraltar as a "country", Familypedia may as well do the same; so please insert it in the "Nation" field for any event listed on Form:Person. 2. As a Special Member State territory of the United Kingdom. 3. Coins and sterling notes are issued by the Government of Gibraltar. 4. Unlike all other UK dependencies but the BIOT. 5. The .eu domain is also used, as it is shared with other European Union members. 6. Before 10 February 2007, 9567 from Spain. /dʒɪˈbrɔːltər/) is a British overseas territory located on the southern end of the Iberian Peninsula at the entrance of the Mediterranean. A peninsula with an area of 6.843 square kilometres (2.642 sq mi), it has a northern border with Andalusia, Spain. The Rock of Gibraltar is the major landmark of the region. At its foot is the densely populated city area, home to almost 30,000 Gibraltarians and other nationalities. An Anglo-Dutch force captured Gibraltar in 1704 during the War of the Spanish Succession. The territory was subsequently ceded to Britain by Spain "in perpetuity" under the Treaty of Utrecht in 1713. It was an important base for the British Royal Navy; today its economy is based largely on tourism, financial services, and shipping. Gibraltar became a key base for the British Royal Navy and played an important role prior to the Battle of Trafalgar and during the Crimean War of 1854-56, due to its strategic location. Its strategic value increased with the opening of the Suez Canal as it lay on the sea route between the UK and the British Empire east of Suez. In the later 19th Century there were major investments in improving the fortifications and the port. During World War II, Gibraltar's civilian population was evacuated (mainly to London, England, but also to parts of Morocco, Madeira and Jamaica) and the Rock was strengthened as a fortress. Spanish dictator Francisco Franco's reluctance to allow the German Army onto Spanish soil frustrated a German plan to capture the Rock, codenamed Operation Felix. In the 1950s, Franco renewed Spain's claim to sovereignty over Gibraltar and restricted movement between Gibraltar and Spain. Gibraltarians voted overwhelmingly to remain under British sovereignty in a 1967 referendum which led to the passing of the Gibraltar Constitution Order in 1969. In response, Spain completely closed the border with Gibraltar and severed all communication links. The border with Spain was partially reopened in 1982, and fully reopened in 1985 prior to Spain's accession into the European Community. The 2007 election was contested by the Gibraltar Social Democrats (GSD), Gibraltar Socialist Labour Party (GSLP)-Gibraltar Liberal Party (GLP) Alliance, the Progressive Democratic Party (PDP) and two independents. Two parties which fielded candidates in the 2003 election did not present candidates in the 2007 election; the Reform Party was wound up and Gibraltar Labour Party absorbed into the GSD in a merger in 2005. A new party, the PDP, was formed in 2006 and fielded candidates in the 2007 election, but none were elected. Three political parties are currently represented in the Parliament: the governing GSD, and two opposition parties - the GSLP and the GLP which are in an electoral alliance and form a single parliamentary grouping. The head of Government is the Chief Minister (as of June 2010, Peter Caruana QC). All local political parties oppose any transfer of sovereignty to Spain, instead supporting self-determination. The main UK opposition parties also support this policy and it is UK Government policy not to engage in talks about the sovereignty of Gibraltar without the consent of the people of Gibraltar. Most of the Rock's upper area is covered by a nature reserve, which is home to around 230 Barbary Macaques (commonly confused with apes), the only wild monkeys found in Europe. Recent genetic studies and historical documents point to their presence on the Rock before its capture by the British. A superstition analogous to that of the ravens at the Tower of London states that if the monkeys ever leave, so will the British. In 1944 British Prime Minister Winston Churchill, was so concerned about the dwindling monkey population that he sent a message to the Colonial Secretary requesting that something be done about the situation. Other mammals found in Gibraltar include rabbits, foxes and bats. Dolphins and whales are frequently seen in the Bay of Gibraltar. Migrating birds are very common and Gibraltar is home to the only Barbary Partridges found on the European continent. The British military traditionally dominated the Gibraltar's economy, with the naval dockyard providing the bulk of economic activity. This however, has diminished over the last twenty years, and is estimated to account for only 7% of the local economy, compared to over 60% in 1984. Today, Gibraltar's economy is dominated by four main sectors – financial services, internet gaming, shipping and tourism (including retail for visitors). Gibraltarians often converse in Llanito (pronounced [ʎaˈnito]). It is an Andalusian Spanish based vernacular and unique to Gibraltar. It consists of an eclectic mix of Andalusian Spanish and British English as well as languages such as Maltese, Portuguese, Italian of the Genoese variety and Haketia (Ladino). Andalusian Spanish is the main constituent of Llanito, but is also heavily influenced by British English. However, it borrows words and expressions of many other languages, with over 500 words of Genoese and Hebrew origin. It also often involves code-switching to English. There exists a small amount of literary writings by native Gibraltarians. The first work of fiction was probably Héctor Licudi's 1929 novel Barbarita, written in Spanish. It is a largely autobiographical account of the adventures of a young Gibraltarian man. Throughout the 1940s and 1950s, several anthologies of poetry were published by Leopoldo Sanguinetti, Albert Joseph Patron, and Alberto Pizzarello. The 1960s were largely dominated by the theatrical works of Elio Cruz and his two highly acclaimed Spanish language plays La Lola se va pá Londre and Connie con cama camera en el comedor. In the 1990s, the Gibraltarian man-of-letters Mario Arroyo published Profiles (1994), a series of bilingual meditations on love, loneliness and death. Of late there have been works by the essayist Mary Chiappe such as her volume of essays Cabbages and Kings (2006) and by academic M. G. Sanchez, author of the novel Rock Black 0-10: A Gibraltar fiction (2006). Motorists, and on occasion pedestrians, crossing the border with Spain have been subjected to long delays and searches by the Spanish authorities. Spain has closed the border during disputes or incidents involving the Gibraltar authorities, such as the Aurora cruise ship incident  and when fishermen from the Spanish fishing vessel Piraña were arrested for illegal fishing in Gibraltar waters. Gibraltar's defence is the responsibility of the tri-service British Forces Gibraltar. In January 2007, the Ministry of Defence announced that the private company - SERCO - would provide services to the base. The announcement resulted in the affected trade unions striking. ^ Abstract of Statistics 2009, Statistics Office of the Government of Gibraltar, p. 2, http://www.gibraltar.gov.gi/images/stories/PDF/statistics/2009/Abstract%20of%20Statistics%20Report%202009%20Website.pdf The civilian population includes Gibraltarian residents, other British residents (including the wives and families of UK-based servicemen, but not the servicemen themselves) and non-British residents. Visitors and transients are not included. In 2009, this broke down into 23,907 native born, 3,129 UK British, 2,395 Other for a total population of 29,431. On census night there were 31,623 people present in Gibraltar. ^ "History of Gibraltar". Government of Gibraltar. http://www.gibraltar.gov.gi/gov_depts/port/port_index.htm. Retrieved 2007-12-20. ^ Choi, Charles (2006). "Gibraltar". MSNBC.COM. http://www.msnbc.msn.com/id/14817677/. Retrieved 2010-01-08. ^ Cahoon, Ben (2000). "Gibraltar". WorldStatesmen. http://www.worldstatesmen.org/Gibraltar.html. Retrieved 2007-12-20. ^ "Regions and territories: Gibraltar". British Broadcasting Corporation. 2007-07-18. http://news.bbc.co.uk/2/hi/europe/country_profiles/3851047.stm. Retrieved 2007-12-20. ^ Mark Oliver; Sally Bolton, Jon Dennis, Matthew Tempest (4 August 2004). "Gibraltar". London: Guardian Unlimited. http://www.guardian.co.uk/gibraltar/story/0,,634007,00.html. Retrieved 2007-12-20. ^ Corrected transcript of evidence taken before the Foreign Affairs Select Committee; 2008-03-28; Answer to Question 257 by Jim Murphy: [T]he UK Government will never – "never" is a seldom-used word in politics – enter into an agreement on sovereignty without the agreement of the Government of Gibraltar and their people. In fact, we will never even enter into a process without that agreement. ^ "Laws of Gibraltar - On-line Service". Gibraltarlaws.gov.gi. http://www.gibraltarlaws.gov.gi/constitution.php. Retrieved 2011-05-13. ^ "The Gibraltar Parliament". Gibraltar.gov.gi. http://www.gibraltar.gov.gi/the-gibraltar-parliament. Retrieved 2011-05-13. ^ GPA.gi, Gibraltar Police Authority, About the Gibraltar Police Authority - Other Duties and Responsibilities - Accountability: "1. to be accountable to the Governor on policing aspects of national security including internal security (section 12); 2. to be accountable to the Government for those parts of the Annual Policing Plan which do not relate to national security (section 15)." ^ The Committee Office, House of Commons. "Statement by the Minister for Europe". Publications.parliament.uk. http://www.publications.parliament.uk/pa/cm200708/cmselect/cmfaff/147/8032602.htm. Retrieved 2011-05-13. ^ "Gibraltar should join South West for elections to European Parliament". Electoral Commission. 28 August 2003. Archived from the original on 2007-12-05. http://web.archive.org/web/20071205011910/http://www.electoralcommission.org.uk/media-centre/newsreleasereviews.cfm/news/226. Retrieved 2007-12-20. ^ "Gibraltar Water Supply". AquaGib. http://www.aquagib.gi/gibraltar_water_supply.html. Retrieved 2007-12-20. ^ The Maltese Islands, Department of Information - Malta. ^ Casciani, Dominic (2004-07-22). "Churchill sends telegram to protect apes". BBC News. http://news.bbc.co.uk/1/hi/uk/3917987.stm. Retrieved 2011-05-13. ^ "Tax Information". Government of Gibraltar. http://www.gibraltar.gov.gi/e-business/taxation. Retrieved 2011-05-09. ^ "Microsoft Word - 1983-13o.doc" (PDF). http://www.gibraltarlaws.gov.gi/articles/1983-13o.pdf. Retrieved 2011-05-13. ^ "Financial Services Commission". Fsc.gi. http://www.fsc.gi/fsc/home.htm. Retrieved 2011-05-13. ^ "Microsoft Word - 2007-03o.doc" (PDF). http://www.gibraltarlaws.gov.gi/articles/2007-03o.pdf. Retrieved 2011-05-13. ^ a b "Currency Notes Act, Section 6". Government of Gibraltar. 11 May 1934. http://www.gibraltarlaws.gov.gi/articles/1934-06o.pdf. Retrieved 2007-12-20. ^ Madge, A; A. Simons (June 2000). "Gibraltar". Guardian International Currency Corp. Archived from the original on 2007-10-11. http://web.archive.org/web/20071011135336/http://guardianfx.com/information/europe/gibraltar.html. Retrieved 2007-12-20. ^ Census of Gibraltar 2001. ^ "Culture of Gibraltar". Everyculture. http://www.everyculture.com/Ge-It/Gibraltar.html#orientation. Retrieved 2007-10-05. ^ "Gibraltar Ethnologue profile". Ethnologue. http://www.ethnologue.com/show_language.asp?code=eng#Gibraltar. Retrieved 2007-09-21. ^ "Gibraltar Methodist Church". The Methodist Church. http://www.methodist.org.gi/. Retrieved 2007-10-30. ^ "''Official Gilbraltarian Baha'i Website''". Gibnet.com. http://www.gibnet.com/bahai/. Retrieved 2011-05-13. ^ "People". Official Government of Gibraltar London website. 2005. Archived from the original on 2007-10-13. http://web.archive.org/web/20071013194341/http://gibraltar.gov.uk/hol/people.asp. Retrieved 2007-11-06. ^ Jacobs, Joseph. "Gibraltar". JewishEncyclopedia.com. http://www.jewishencyclopedia.com/view.jsp?artid=220&letter=G. Retrieved 2007-11-06. ^ "Education & Training". Government of Gibraltar. 7 April 2003. http://www.gibraltar.gov.gi/gov_depts/education/education_index.htm. Retrieved 2007-12-20. ^ "Gibraltar Health". TravelPuppy. http://travelpuppy.com/gibraltar/health.htm. Retrieved 2007-12-20. ^ "Gibraltar Health Authority". Gha.gi. http://www.gha.gi/httpdocs/index.htm. Retrieved 2011-05-13. ^ Yborra Aznar, José Juan (2004). "La ciudad perdida: Gibraltar en la obra de Héctor Licudi" (in Spanish). Eúphoros (7): 317–326. ISSN 1575-0205. ^ Mascarenhas, Alice. "Always a Pleasure to Perform in Gibraltar". The Gibraltar Chronicle. Archived from the original on 2007-09-28. http://web.archive.org/web/20070928050953/http://www.chronicle.gi/Features/Charles+Ramirez/charles+ramirez.htm. Retrieved 2007-12-20. ^ "Newsletter No". Friends of Gibraltar Heritage Society. 70 November 2004. Archived from the original on 2007-12-01. http://web.archive.org/web/20071201121115/http://www.foghs.org.uk/nl/70.pdf. Retrieved 2007-12-20. ^ "Communiqué of the ministerial meeting of the forum of dialogue on Gibraltar". Government of Gibraltar. 18 September 2006. http://www.gibraltar.gov.gi/pensions/Ministerial_Statement.pdf. Retrieved 2008-10-17. 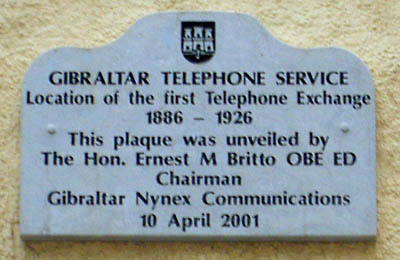 ^ Government of Gibraltar (18 September 2006). "Trilateral Forum. Ministerial Statement on Pensions". http://www.gibraltar.gov.gi/latest_news/press_releases/2006/Ministerial_Statement_On_Pensions.pdf. Retrieved 2008-10-17. ^ "Press Release. Airport Agreement". Government of Gibraltar. 18 September 2006. http://www.gibraltar.gov.gi/latest_news/press_releases/2006/271-2006.pdf. Retrieved 2008-10-17. ^ "Spain restores Gibraltar air link". British Broadcasting Corporation. 16 December 2006. http://news.bbc.co.uk/go/rss/-/2/hi/europe/6198314.stm. Retrieved 2007-12-20. ^ Government of Gibraltar. "Press Release: Government of Gibraltar Reaction to GB Sale". http://www.gibraltar.gov.gi/latest_news/press_releases/2007/239-2007.pdf. Retrieved 2008-10-16. ^ "Regional Andalusia airline begins Gibraltar-Madrid airbridge". MercoPress. http://en.mercopress.com/2009/04/30/regional-andalusia-airline-begins-gibraltar-madrid-airbridge. Retrieved 2010-03-09. ^ "Andalus drops Gibraltar". Panorama.gi. http://www.panorama.gi/localnews/headlines.php?action=view_article&article=5758&offset=0. Retrieved 2011-05-13. ^ Government of Gibraltar. "Press Release: New Air Terminal, tunnel under the runway and new road leading to all parts of Gibraltar north of the runway". http://www.gibraltar.gov.gi/latest_news/press_releases/2007/111-2007.pdf. Retrieved 2008-10-17. and images of the proposals: "Press Release: New Terminal Building". http://www.gibraltar.gov.gi/latest_news/press_releases/2007/111-2007-images.pdf. Retrieved 2008-10-17. ^ "The Chief Minister presented the plans for an ambitious new terminal building for Gibraltar Airport". 7 Days Gibraltar. http://www.7daysgibraltar.com/article.php?id=655. Retrieved 2007-12-21. ^ The Committee Office, House of Commons. "Frontier restrictions". Publications.parliament.uk. http://www.publications.parliament.uk/pa/cm199899/cmselect/cmfaff/366/36605.htm. Retrieved 2011-05-13. ^ "Fishermen block frontier". Panorama.gi. http://www.panorama.gi/localnews/headlines.php?action=view_article&article=1615. Retrieved 2011-05-13. ^ "HIVE Location overview - Gibraltar". Ministry of Defence. December 2007. http://www.mod.uk/NR/rdonlyres/1B9B3D6A-1D09-49B1-9209-3AE16C1614F8/0/20080201_gibraltar_lo.pdf. Retrieved January 2010. ^ "House of Commons Hansard Written Answers". Parliament of the United Kingdom. 9 November 1999. http://www.parliament.the-stationery-office.co.uk/pa/cm199798/cmhansrd/vo981109/text/81109w21.htm. Retrieved 2007-12-20. ^ Giles Tremlett in Madrid. "Guardian.co.uk". Guardian.co.uk. http://www.guardian.co.uk/world/2004/jul/24/gibraltar.falklands. Retrieved 2011-05-13. ^ Vest, Jason; Wayne Madsen (1 March 1999). "Foreign-operated accommodation site that provides occasional SIGINT product to the USSS". http://jya.com/nsa-scs.htm. Retrieved 2007-12-20. ^ "Early 20th century communications interception in Spain: a historical perspective". Statewatch. http://www.statewatch.org/news/2004/aug/10spain-gib-comint.htm. Retrieved 2007-12-20. ^ Searle, Dominique (12 May 2009). "Gibraltar-Madeira Twinning". Gibraltar Chronicle. http://www.chronicle.gi/headlines_details.php?id=16040. Retrieved 2009-05-27. 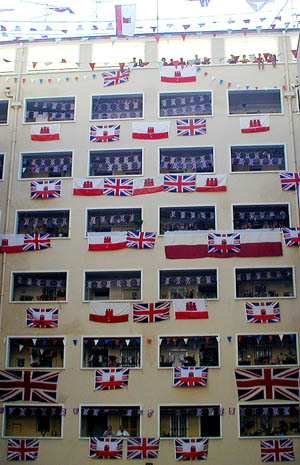 ^ "Gibraltar Twinned". madeira4u. 15 May 2009. http://www.madeira4u.com/blog.html/4163. Retrieved 2009-05-27. ^ Searle, Dominique (27 May 2009). "Twinned". Gibraltar Chronicle. http://www.chronicle.gi/headlines_details.php?id=16201. Retrieved 2009-05-27. ^ "Mayor set for Gibraltar - Ballymena twinning". Gibraltar News Online. 25 April 2006. http://www.gibraltarnewsonline.com/2006/04/25/mayor-set-for-gibraltar-ballymena-twinning/. Retrieved 2007-12-20. ^ "Newsletter No 24". Friends of Gibraltar Heritage Society. October 2005. Archived from the original on 2007-12-01. http://web.archive.org/web/20071201121105/http://www.foghs.org.uk/nl/74.pdf. Retrieved 2007-12-20. Bond, Peter. "Gibraltar's Finest Hour The Great Siege 1779-1783". 300 Years of British Gibraltar 1704-2004 (1st Edition ed.). Gibraltar: Peter-Tan Publishing Co.. pp. 28–29. Chartrand, René. 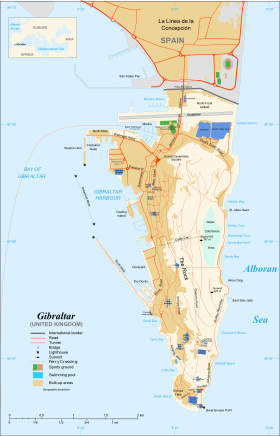 Gibraltar 1779–1783: The Great Siege. Patrice Courcelle (1st Edition ed.). Gibraltar: Osprey Publishing. ISBN 9781841769776. http://www.ospreypublishing.com/title_detail.php/title=S9770. This page uses content from the English language Wikipedia. The original content was at Gibraltar. The list of authors can be seen in the page history. As with this Familypedia wiki, the content of Wikipedia is available under the Creative Commons License.